A new collection of 73 essays that describe the enormous potential of the commons in conceptualizing and building a better future, edited by David Bollier and Silke Helfrich. We are poised between an old world that no longer works and a new one struggling to be born. Surrounded by centralized hierarchies on the one hand and predatory markets on the other, people around the world are searching for alternatives. The Wealth of the Commons explains how millions of commoners have organized to defend their forests and fisheries, reinvent local food systems, organize productive online communities, reclaim public spaces, improve environmental stewardship and re-imagine the very meaning of “progress” and governance. In short: how they’ve built their commons. In 73 timely essays by a remarkable international roster of activists, academics and project leaders, this book chronicles ongoing struggles against the private commoditization of shared resources – often known as “market enclosures” – while documenting the immense generative power of the commons. 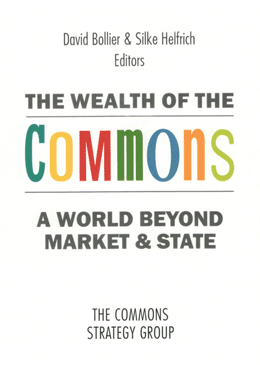 The Wealth of the Commons is about history, political change, public policy and cultural transformation on a global scale – but most of all, it’s about commoners taking charge of their lives and their endangered resources. It’s about common people doing uncommon things. Federico Heinz (Argentina) is programmer and free software activist and co-founder of Vía Libre foundation, which promotes free knowledge as the driver for social development. He has tendered advice to many parliamentarians in various Latin American countries on the preparation of bills concerning the use of free software in public administration. Christa Müller (Germany) is a sociologist and author. For many years she has been committed to research on rural and urban subsistence. She is executive partner of the joint foundation “anstiftung & ertomis” in Munich. Her most recent book (in German) is Urban Gardening: About the Return of Gardens into the City. She blogs at http://urban-gardening.eu. Stefan Meretz (Germany) is an engineer, computer scientist, and author who lives in Berlin. His publications focus on commons-based peer production and development of a free society beyond market and state. He blogs at http://keimform.de. Maude Barlow (Canada) is an activist, author and organizer who has been deeply involved in the global fight for the right to water. She served as Senior Advisor to the 63rd President of the United Nations General Assembly and received the Right Livelihood Award in 2005. Benjamin Mako Hill (USA) is a researcher and PhD Candidate at MIT and a fellow at Harvard’s Berkman Center for Internet and Society. He studies social structure in free culture and free software communities and is an active participant in many free software and free culture projects. Friederike Habermann (Germany) is an economist, historian and PhD in political science whose work focuses on the interconnectedness of power relations, transnational social movements and alternative subsistence strategies. Jonathan Rowe (USA), a long-time activist/thinker, wrote extensively about the deep limitations of conventional economics, the spiritual pathologies of market culture and the appeal of the commons in imagining a better world. He was an editor at the Washington Monthly magazine, staff writer at the Christian Science Monitor, and the first director of the Tomales Bay Institute, later renamed On the Commons. Rowe died suddenly on March 20, 2011. Neal Gorenflo (USA) is the Co-Founder and publisher of Shareable magazine, a nonprofit online magazine about sharing. As a former market researcher, stock analyst, and Fortune 500 strategist, Neal left the corporate world in 2004 to help people share through Internet startups, grassroots organizing and a circle of friends committed to the common good. Eva Friman (Sweden) is researcher and program director at Cemus at Uppsala Centre for Sustainable Development at Uppsala University. She is an intellectual historian and ecological economist, with a research interest in history and theories of science, and interdisciplinary sustainability studies. Christian Siefkes (Germany) is a software engineer who lives in Berlin. His main research interest is the emancipatory potential of free software and other forms of commons-based peer production. He blogs at http://keimform.de. His publications include From Exchange to Contributions (Berlin 2007) and The Emergence of Benefit-driven Production (Proceedings of OKCon 2011).